Another contribution to Julia Kay's Portrait Party., the Flickr group of near 400 artists who post photos of themselves and then proceed to draw and paint each other. Great fun. Great people. Buen retrato, Harry, con un solo color. Mucha expresividad en tus figuras, como siempre. Buen juego luz sombra. Me gusta. You take colors that are supposed to be soothing and calming and make this intense, almost frightening portrait! You teach by sharing your work! You are also the club of feeling blue. Organisation of the new house and also my new studio. so I have no new work. Gracias, Manel. No he sido lo suficientemente bien para hacer la pintura más o recientemente blogs. Así que estaba contento de conseguir por lo menos esta pintura acuarela pequeño hecho, a pesar de la frescura del color que se mató a más de trabajo. Se parecía demasiado a la pintura por números para tener energía real. Ha sido increíble en su puesto fuera en los últimos meses! Hi Celeste. Afraid i haven't been up to doing a lot of painting lately (or blogging for that matter) so was glad to something, anything, done, even if it has turned out like a grumpy moon, lol. I love watercolor, JB. I love its quirky little ways and the beauty it so readily yields up if you talk to it nicely. Afraid this time i insulted it by 'painting by numbers', killing of its freshness. I hate just 'coloring in'. Never mind, at least i got brush on paper again. Rhonda, i started out wanting to do something dramatic but a bit lyrical but then it turned on me and said 'menacing' instead. I guess the unconscious will just have its say, lol. Hi Azucena. Yes, i'm in blue club at the moment. 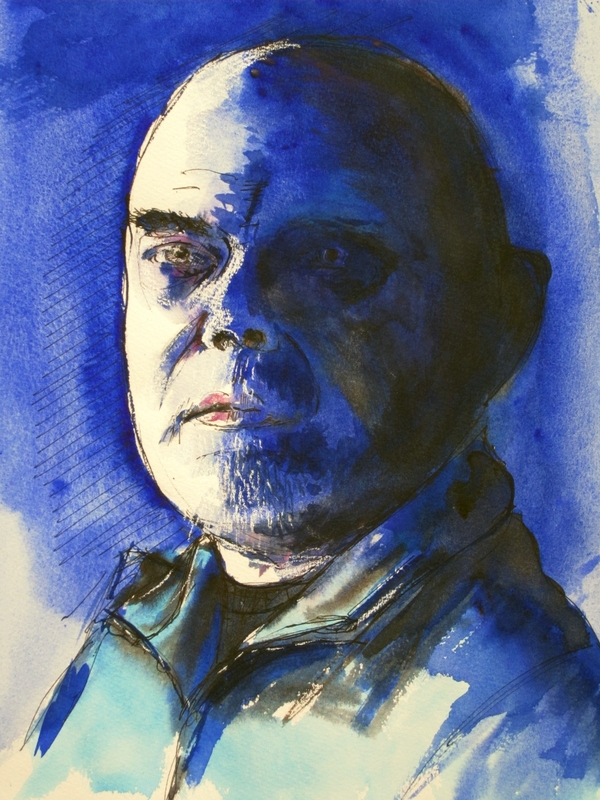 But even at the best of times i'm just a sucker for Ultramarine in watercolor (and it granulates so nicely too) and Prussian blue in oils. Thanks, Marialuisa. The 'party' is actually a virtual one on line at Flickr. You'd be most welcome to join it, i'm sure, if youre interested. I would love to see your drawings there. Heya, Laura. Dan's photo did all the work for me with the light. Paulo, moving house?! Exciting and exhausting. Hope you will have a good space for painting. We will all be here to greet you back when youre ready. Ciao.